Nearly half of the news stories over last year’s holiday season that linked the holidays and suicide perpetuated the myth that there is an increase in suicides from Thanksgiving through January, according to an analysis by the Annenberg Public Policy Center. The annual analysis found that 47 percent of the stories in the Nexis database over the 2015-16 holiday season upheld the false connection while 53 percent debunked it, the same as the prior year (see Figure 1). 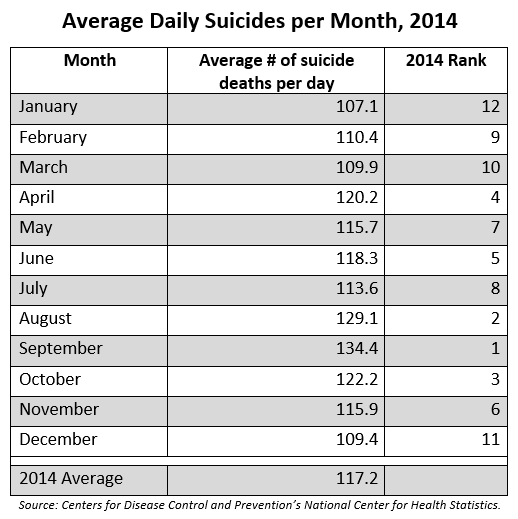 In fact, the holiday season usually has the lowest suicide rates of the year (see Figure 2). Data from the Centers for Disease Control and Prevention (CDC) show that in 2014 (the latest year of available data), December and January had the fewest average suicide deaths per day. The rate in November was slightly below the average for the year. The highest daily rates usually occur between April and August – and in 2014, were in August and September (see Table 1 below). APPC has tracked news coverage on this issue for 17 years, starting in 1999-2000, and only in two of those years have more than 60 percent of stories debunked the myth. 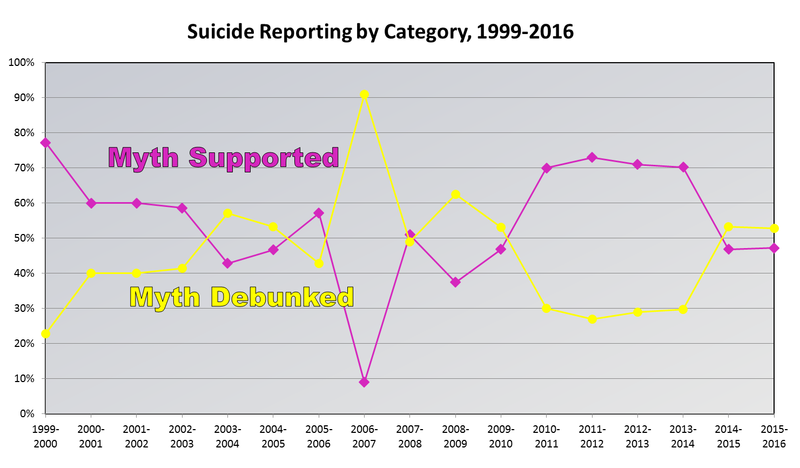 About half of the years have seen a roughly even split in the number of news stories that have upheld or debunked the myth that suicides increase around the holidays. In other years, the myth was supported by a majority of the stories. “This is a very difficult myth to erase,” Romer said. Figure 2. 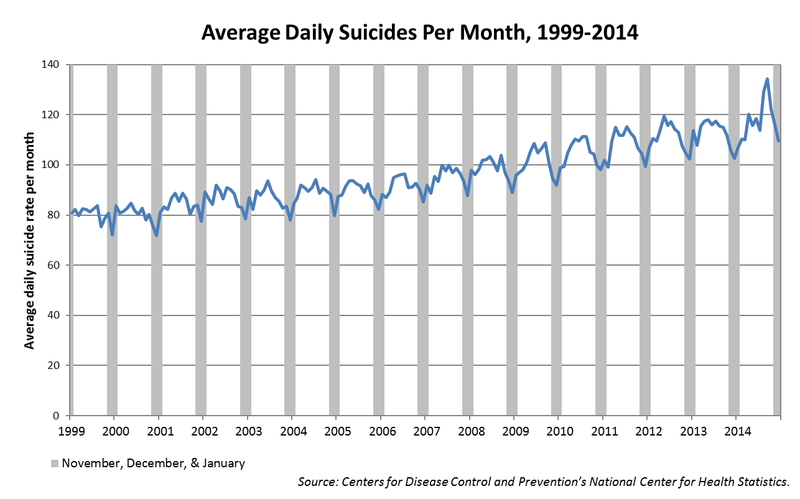 Average number of suicides per day in each month from January 1999 to December 2014. Data from November, December and January are shaded. Source: Centers for Disease Control and Prevention’s National Center for Health Statistics. Another example, from the Reno Gazette-Journal in Nevada, tries to have it both ways: “Although it is purportedly a myth that suicide rates increase during the holiday season, this can nonetheless be a difficult time for a great many of us.” Saying that the myth has purportedly been debunked does little to dispel doubts. Recommendations for media coverage of suicide (see www.reportingonsuicide.org) note that reporters should consult reliable sources on suicide rates, such as those produced by the CDC, and provide information about resources that can be helpful to those in need. Other resources include the Suicide Prevention Resource Center, www.sprc.org, and the CDC: http://www.cdc.gov/ViolencePrevention/suicide/holiday.html. The U.S. Surgeon General’s strategy for the prevention of suicide encourages more accurate reporting on the causes: http://www.samhsa.gov/prevention/suicide.aspx. The U. S. National Suicide Prevention Lifeline can be reached at 800-273-TALK (8255). News and feature stories linking suicide with the holidays were identified through the Nexis database, with “suicide” and “Thanksgiving/Christmas/New Years” or “holidays” as search terms from November 15, 2015 through January 31, 2016. Researchers evaluated whether the stories supported the link, debunked it, or showed a coincidental link. Only domestic suicides were counted; overseas suicide bombings, for example, were excluded. Thanks go to Ilana Weitz, who collected and supervised the coding of the stories, and to Anna Rose Bedrosian and Daniel Bersani-Molina for assistance in coding. Thanks also go to Alex Crosby of the CDC for assistance in obtaining monthly rates of suicide. To download this release, click here. Table 1. Average number of suicides per day in each month in 2014. Source: Centers for Disease Control and Prevention’s National Center for Health Statistics.